Rings There are 30 products. 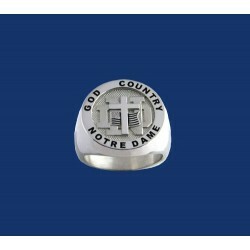 The words “Notre Dame” are cut into the top of the ring. 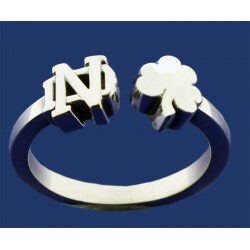 The dangle charm has the leprechaun on one side and the ND logo on the other side.The charm is 1/2″ in length. Can be engraved. Cost $30. Sharp 3 dimensional detail. Allow 2 to 3 weeks for delivery. Leprechauns encircle the band. The ladies’ band is approximately 1/4″ (6 1/2 mm) wide. Can be engraved inside. Cost $30. Sharp 3 dimensional detail. Allow 2 to 3 weeks for delivery. Leprechauns encircle the band.The men’s band is approximately 3/8″ (10 mm ) wide. Can be engraved inside. Cost $30. Sharp 3 dimensional detail. Allow 2 to 3 weeks for delivery. ND logos encircle the band. The ladies’ band is approximately 1/4″ (6 1/2 mm) wide. Can be engraved inside. Cost $30. Sharp 3 dimensional detail. Allow 2 to 3 weeks for delivery. ND logos encircle the band. The men's band is approximately 3/8″ wide (10mm). Can be engraved inside. Cost $30. Sharp 3 dimensional detail. Allow 2 to 3 weeks for delivery. 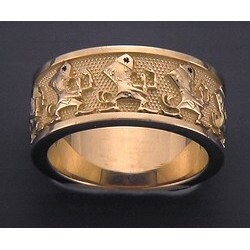 The men's ring top is approximately 5/8″ wide. Can be engraved inside. Cost $30. Sharp 3 dimensional detail. Allow 2 to 3 weeks for delivery. Ladies' ring top is approximately 1/2″ wide. Can be engraved inside. Cost $30. Sharp 3 dimensional detail. Allow 2 to 3 weeks for delivery. Men's ring top is approximately 5/8″ wide. Can be engraved inside. Cost $30. Sharp 3 dimensional detail. Allow 2 to 3 weeks for delivery. The ladies' ring top is approximately 1/2″ wide. Can be engraved inside. Cost $30. Sharp 3 dimensional detail. Allow 2 to 3 weeks for delivery. The 14kt gold ring can be purchased with the leprechaun rhodium plated to give the ring a two-tone look.The two-tone look is not available in the sterling silver ring. It is all silver in color. Men's ring top is approximately 5/8″ wide. Can be engraved inside. Cost $30. Sharp 3 dimensional detail. Allow 2 to 3 weeks for delivery. The 14kt gold ring can be purchased with the leprechaun rhodium plated to give the ring a two-tone look. The two-tone look is not available in the sterling silver ring. It is all silver in color. Ladies' ring top is approximately 1/2″ wide. Can be engraved inside. Cost $30. Sharp 3 dimensional detail. Allow 2 to 3 weeks for delivery. The ND logo is on the top. The shamrock is on one side panel and the leprechaun is on the other side panel. Ladies' ring top is approximately 1/2″ wide. Can be engraved inside. Cost $30. Sharp 3 dimensional detail. Allow 2 to 3 weeks for delivery. The ND logo is on the top. The shamrock is on one side panel and the leprechaun is on the other side panel. Men's ring top is approximately 3/4″ wide. Can be engraved inside. Cost is $30. Sharp 3 dimensional detail. Allow 2 to 3 weeks for delivery. Men's ring top is approximately 5/8″ wide. Can be engraved inside. Sharp 3 dimensional detail. Allow 2 to 3 weeks for delivery. Ladies' ring top is approximately 1/2″ wide. Can be engraved inside. Sharp 3 dimensional detail. Allow 2 to 3 weeks for delivery. 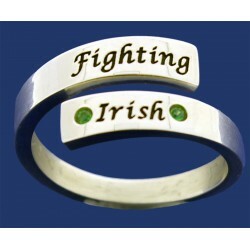 Ladies sterling silver ND cut-out ring has the shamrock on one side and the leprechaun on the other. Top is approximately 1/2" wide from top of ND to bottom. Choice of blue, green or black inking. Sharp 3 dimensional detail Allow 2 to 3 weeks for delivery. 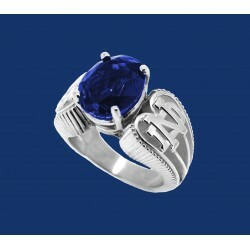 Ladies sterling silver fancy stone ring has the ND on each side of the stone. Center stone is 12mm x 10mm. Choice of: Alpinite - color emerald green Quartz - color topaz gold Spinel - color sapphire blue Sharp 3 dimensional detail. Allow 2 to 3 weeks for delivery. Alternating ND logo & Leprechaun encircle the band. The men's band is approximately 3/8″ wide (10mm). Can be engraved inside. Cost $30. Sharp 3 dimensional detail. Allow 2 to 3 weeks for delivery. 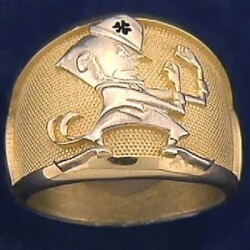 Alternating ND logo and Leprechaun encircle the band.The ladies’ band is approximately 1/4″ (6 1/2 mm) wide. Can be engraved inside. Cost $30. Sharp 3 dimensional detail. Allow 2 to 3 weeks for delivery. Men's sterling silver ND cut-out ring has the shamrock on one side and the leprechaun on the other. Top is approximately 5/8" wide from top of ND to bottom. Choice of blue, green or black inking. Sharp 3 dimensional detail Allow 2 to 3 weeks for delivery. 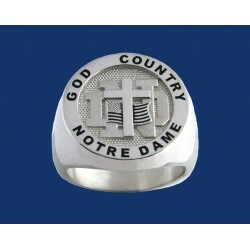 Shiny ND Logo with beaded shank.Sharp 3 dimensional detail. Allow 2 to 3 weeks for delivery. 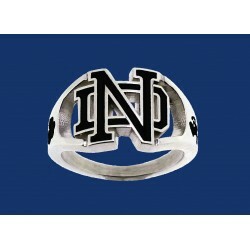 Shiny ND Logo with braided shank.Sharp 3 dimensional detail. Allow 2 to 3 weeks for delivery. Ladies wrap band with Fighting Irish & alpinite (emerald green) stones.Sharp 3 dimensional detail. Allow 2 to 3 weeks for delivery. Ladies Wrap Band with ND Logo & Irish in ShamrockSharp 3 dimensional detail. Allow 2 to 3 weeks for delivery. Ladies Open ND & Shamrock RingSharp 3 dimensional detail. Allow 2 to 3 weeks for delivery. Ladies Swirl Band with ND LogoSharp 3 dimensional detail. Allow 2 to 3 weeks for delivery.